The baseline evaluation provides a “snapshot” of societal awareness and perceptions about marine litter across Europe, and trends across a range of stakeholder groups. It examines individuals’ perceptions about the quantity, location, causes and consequences of marine litter, perceived risk and responsibility, and behavioural intentions to engage in solutions. A subsequent assessment of stakeholder perceptions will be conducted in year three, the final year of the project.  What are European attitudes and perceptions about marine litter?  Do perceptions vary according to stakeholder group/sector?  Do perceptions vary across participating countries? A total of 3748 respondents completed the survey across Europe and across a range of stakeholder groups. Overall, the majority of respondents reported noticing litter on most or every visit to the coast. Respondents were concerned about marine litter and perceived the marine environment as being highly valuable to society. Litter was believed to be present in all locations of the marine environment, largely near urban areas and on beaches, and with the least in polar seas. Marine litter was also perceived to pose several negative impacts. Respondents believed that plastic represents 45.5% of marine litter – this signifies a large underestimate according to the literature. Respondents believed government, industry, commercial users and general public are highly responsible but less competent and even less motivated to take action to reduce marine litter. This is in comparison to independent scientists and environmental groups who were perceived as least responsible, yet most competent and motivated. Respondents reported being likely to take several actions themselves to reduce marine litter and perceived that it would be reasonably easy to take these actions. Respondents from different stakeholder groups and different countries shared many of the same perceptions about marine litter. For example, there was a similar pattern of results across stakeholder groups and participating countries when considering the relative quantity of litter across the different marine environments, the contribution of different pathways by which litter can enter the marine environment, and the relative severity of the different impacts. However, some differences in perceptions did emerge between stakeholder groups and between countries. 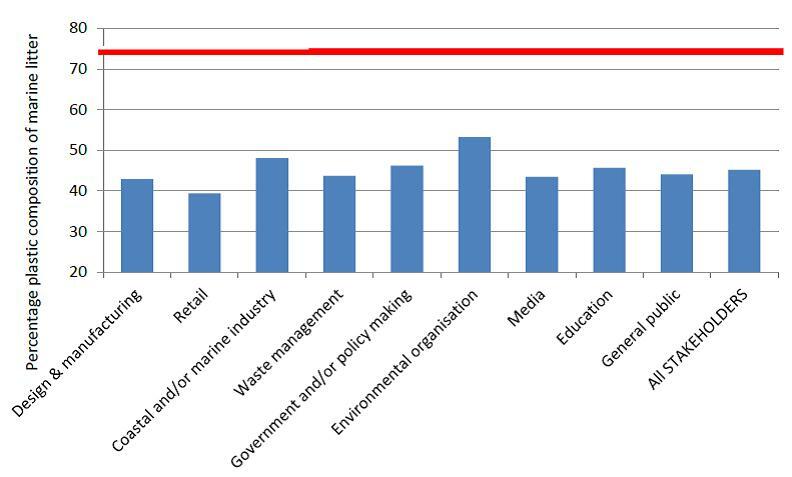 For example, environmental organisations were most concerned about marine litter, whereas respondents working in design and manufacturing and retail were slightly less concerned than other stakeholder groups. Similarly, respondents from Portugal, Slovenia, the UK, Germany and Greece were more concerned about the problem of marine litter compared to other countries, particularly Romania, the Netherlands, Cyprus and Denmark who reported being the least concerned about the problem. 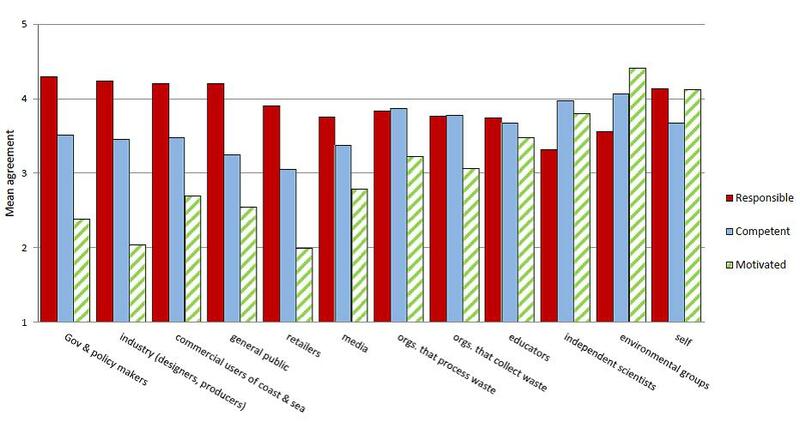 In addition, although all stakeholder groups underestimated the percentage of marine litter that consists of plastic, environmental organisations and coastal and marine industry reported the highest percentage of plastic compared to other stakeholders, particularly those from retail and design and manufacturing sectors who reported the lowest percentage composition of plastic. Perceptions about the percentage of marine litter that is composed of plastic by stakeholder group. The reference line at 75% indicates the ‘actual’ proportion of plastic that is commonly reported in the literature. Similarly, all countries underestimated the percentage of marine litter that consists of plastic, particularly respondents from Cyprus, Denmark, Romania, Italy, Portugal and Turkey who reported the lowest percentage composition of plastic. Respondents from the UK, Germany and Slovenia reported the highest proportion of plastic in marine litter. Further, those from environmental organisations along with respondents from Greece, Portugal and Slovenia reported being the most likely and able to take action.